We’d love your help. Let us know what’s wrong with this preview of Boy and the Very Lonely Pony by Junia Wonders. A tender & heartwarming tale of friendship! A boy and a lonely pony find friendship and comfort in each other. The boy is not feeling well, so he has to stay in bed the whole day. The pony is fenced alone in a field of pasture. They become friends and take an adventure together and their loneliness melts away. The story is subtle yet beautiful. It is a heartwarming story about friendship and is exquisitely drawn and painted in watercolor. It’s the perfect bedtime story for your little one. • Recommended for children between 3 and 8 years. • A tender and heartwarming tale of friendship. • A subtle and sweet little story perfect for winding down just before bedtime. • Beautifully illustrated with soothing nighttime hues, which complement the gentle tone of the story. To ask other readers questions about Boy and the Very Lonely Pony, please sign up. Boy and the Very Lonely Pony is one of the cutest children's read I have picked up in a very long time! This book I acquired through BookBub's program - it was free, so of course I wanted to pick up another sweet children's read! The artwork in this book is absolutely STUNNING! The pony on the cover pulled me in and made me want to read it! The style of this book, with soft colours and blended lines was also fantastic. I like this art style so much, so it's nice to see it included in a children's Boy and the Very Lonely Pony is one of the cutest children's read I have picked up in a very long time! The artwork in this book is absolutely STUNNING! The pony on the cover pulled me in and made me want to read it! The style of this book, with soft colours and blended lines was also fantastic. I like this art style so much, so it's nice to see it included in a children's picture book. The words on the page are sometimes straight, and sometimes curve around the objects/houses. It's a unique way for reading, which I also enjoyed. It makes the book more fun! If you are looking for a book about friendship, then you should definitely pick this one up! It's a great introduction to how kids and be friends (with not only people, but animals too) and has a wonderful theme behind it. Friendship and overcoming obstacles was the central theme, and it really hit the mark! I would definitely include this on a child's bookshelf or in my schools's local libraries! The book is short and sweet, and I declare this a must read! It's a must read if you have children, and I highly recommend it! The art style is soft and fantastic, the themes and central story is a beautiful tale all kid's should know, and it would be a great bedtime read! This was a cute story with a sweet premise; I just got a little lost in the execution. Parts of the synopsis never made their way into the story, and because of that, the plot felt a bit lacking. 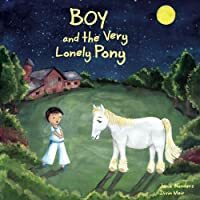 The pony was lonely, and the boy cheered him up, but nothing else really happened, and there was no sense of "why" except the pony's loneliness. Maybe just a few more words and a bit more explanation would have helped? This is a brightly illustrated daydream story for early readers. A young boy sees a grey pony from his window, but the pony has no company all day. When the moon rises the boy sneaks out to talk to the pony and see what they could do together. I like the lesson that two can have more fun than one. Young readers can learn a little from the tale as well as having fun starting to read. Vocabulary is simple. I don't like that the boy doesn't tell his parents where he is going - what family? and does This is a brightly illustrated daydream story for early readers. A young boy sees a grey pony from his window, but the pony has no company all day. When the moon rises the boy sneaks out to talk to the pony and see what they could do together. I don't like that the boy doesn't tell his parents where he is going - what family? and doesn't wear a hard hat to ride. I'm also baffled as to why the boy did not go out during the day to see the pony. This looks much like a retelling of the Snowman story. The pony is basically illustrated, not by an expert on horses. But it's for little kids. I downloaded an e-copy when the author made it available. This is an unbiased review. A very cute story about friendship. The drawings are wonderful also. This book is so cute that it is the world of cuteness. Reading that book and imagining myself reading it to a 4 year old was a totally amazing feeling. The book is filled with colors, pictures and drawings which will keep a toddler engaged and it is short enough to not let their attention wander. The story is light and soft and the book is beautifully Illustrated. A beautiful bed time story. Enjoyable, but not one I would repeat. Sorry, I just found it a little boring. However, I would be interested in seeing other books but the author. Love the graphics. A sad tale that turns into a sweet friendship. I Iike the questions this book brings up for me. Why is the boy staring out the window all day? Why did the pony appear in the corral outside? Is this story real or just wishful thinking? And, does it matter? The illustrations by Divin Meir are beautiful for this bedtime story. This book invites the readers to go on this dreamy journey with the boy and the pony as they join forces to explore the world beyond their previous limits. The illustrations are lovely. The storyline shares about a young boy and a pony who are both lonely and trapped in their spaces - bedroom/fenced field. They escape together to go on an adventure. Open ended discussion - Why are they there? Why did they come back? This book was okay but I thought the pictures could have been clearer. I also though that it was a little boring for a 3 year old. My sons thought the book was “good”. Nice for free but wouldn’t recommend a purchase. A cute little book about a boy that looks out of his window and sees a pony that seems lonely. He goes and introduces himself to the pony and they become friends. I enjoyed the artistry and the simplicity of the story. I didn't get from reading the story that the boy was bedridden, or particularly lonely. I feel like we were given a nugget but sold a mine. With beautiful illustrations and kind, gentle words, Junia Wonders tells the story of how a boy's friendship brings joy to a lonely lonely pony. Greg bedtime book. Very nice little story with some beautiful artwork, but it felt oddly short, even for a kids book. Not sure if that’s just because I read the kindle version and it went by faster, or of it’s just a super short book. Good read nonetheless. My daughter loved the book. I get the feeling we will be seeing it in her bedtime story rotation. A sweet book about a friendship that is beautifully illustrated. This story is very cute although it kind of feels as though the story ends abruptly. My girls enjoyed it. For free on Amazon today. Nice pictures and short, sweet story. I read this story with my little boy and we both loved it! Loved the story and illustrations. The pictures were bright and colorful. Quick easy read for my elementary aged children. Nice short bedtime story for those nights that they want a book but Mommy is also sleepy. This is an odd and quirky story about a lonely boy, but nonetheless enjoyable for that. By the way, before I get started, the text in particular, but also the illustrations are a wee bit small to appreciate on a smart phone (although it is do-able), so I'd recommend the print version or reading this on a pad or tablet. The boy is largely confined to the house, and therefore enjoys gazing out of the window for the beauty of the world outside and for anything else of interest which he sees out there. This is how he first encounters the pony, which to him looks quite sad. When the boy is getting ready for bed, he notices that the pony is looking back at him, and each seems to recognize that something is missing in the other. Seeing the white pony glowing in the stark Moonlight, the boy feels compelled to go visit. At least the boy can go outside. The pony can't go anywhere. Not until the boy rides it and they escape the confining boredom of the pasture and take a night-time tour of the local district. As the sun comes up they return home as friends and fellow travelers. This is just an okay children's book. The illustrations are good, but the story is lacking. For example, from the title we know the pony is lonely, and we find out the boy is too. No wonder. Where are his parents? They are not even drawn into the background of this book. It does teach a love for animals and empathy for others, so kudos for that. The story of to prisoners without anyone to talk to, escaping together and going back due to Stockholme Syndrome. But no, seriously, it's cute. I just don't get why the boy has to climb out the window. Are the stairs sick too? I got this as a free download and thought maybe it would be nice to read to my niece or nephew. It is so cute! And the artwork is amazing! The illustrations are simply beautiful. This is a book that an adult must read to a child. There are lots of opportunities for conversation throughout the story. Good nighttime book for young kids. Nice illustrations and a fun book to read to small children as a. Bedtime story. One of the books my youngest will sit and listen to. The story could have been better had the grammatical errors been addressed and corrected. This story book was full of beautiful full color illustrations, which I loved. I was really enjoying the story and then it suddenly ended! I was disappointed in the storyline and the abrupt ending. There are two things in this world that I love doing the most: writing and reading children's stories. When I'm not doing either of these, you might catch me whispering to dragonflies, chasing rolling pumpkins, traveling the world with a giant wheel of cheese, or simply having a cup of tea and cake with a caterpillar, a clever little rat, a camel, a lonely pony, a couple of riotous retired neighbor There are two things in this world that I love doing the most: writing and reading children's stories. When I'm not doing either of these, you might catch me whispering to dragonflies, chasing rolling pumpkins, traveling the world with a giant wheel of cheese, or simply having a cup of tea and cake with a caterpillar, a clever little rat, a camel, a lonely pony, a couple of riotous retired neighbors, and some school kids who, like me, believe that bullying is not cool at all. I sincerely hope you enjoy reading my books as much as I enjoy writing them. To find out about my books and random musings, visit me at www.juniawonders.com. Don’t forget to download your GIFT at juniawonders.com/gift and be the first to get updates on my upcoming books, discounts, and giveaways.